Changing up your décor to match the season is a great way to keep your home or office from feeling stale or boring without going through the time and expense of completely redecorating the space. However, it can feel a bit daunting. Where do you begin? How far do you take your seasonal décor? Seasonal changes needn’t be all encompassing to make an impact on the feel of your home. Think about what the season means to you. What colors come to mind when you think of spring? How does each season make you feel? You can bring those feelings – the thoughts, textures, and scents – into your home through small, strategic changes in your décor. Spring is a time of renewal, of budding flowers, gentle rains, and new life growing outside our walls. Everything is lighter, from the sun in the sky to the clothes you wear. Bringing that feeling into your home is as easy as making the space feel more light and airy. In the bedrooms, replace the heavy bedding of winter with lightweight, and light-colored, sheets and comforters. Also, consider replacing curtains and drapes with light, spring-colored versions. This immediately lightens the look and feel of any room. The same is true of throw rugs throughout the home, and towels in the kitchen and bath. Mimic the new growth of spring with bouquets of fresh flowers throughout the home and an herb garden in the kitchen window. 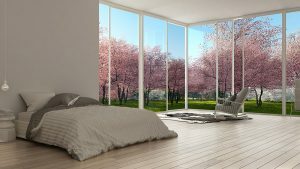 Your home will look and smell like spring. Summer feels like our most casual season. The kids are home from school, workers take their annual vacations, and the heat inspires lightweight clothing, bare feet, and a cool drink in hand. This is the time to embrace your informal, laid-back side. That means uncluttered spaces and cool colors. A fun way to bring the casual feeling of summer into your home is to channel your ideal vacation spot. Do you want your home to feel like a day at the beach? Seashells and driftwood are your friends. Does sipping cocktails poolside sound like heaven? Brightly colored cushions and fresh blooms in clear glass vases help make your living room feel like a poolside patio. If you didn’t already change out the bedding, towels, rugs, and curtains, now is the time to do so. The whole house will look and feel lighter. Fall is synonymous with rich, vibrant colors. Beautiful reds, golds, browns, and oranges are the colors of the season, and incorporating them throughout your home is easy. As with spring and summer, your home’s linens offer your first line of seasonal décor. Curtains and draperies in autumnal colors have an immediate impact on a room. This is also the time to set out your earth-toned throw pillows, bedding, towels, and rugs. The darker colors and heavier fabrics help create a warm feeling throughout the home. While spring is all about flowers and greenery, fall is all about colorful leaves and gourds, which make stunning centerpieces for tables, kitchens, and hearths. Pumpkins, squashes, dried corncobs, leaves, and pinecones also make beautiful fall wreaths. Winter makes us think of holidays with family and cold nights in front of the fire with a warm drink or a good book (or both!). Many people think of Christmas décor when they think of decorating their homes for the winter. However, if you want a seasonal look that lasts, you need to look beyond red, white, and green. Make a room feel warmer instantly with lamps, books on the end tables, and a soft, cozy afghan thrown over a sofa or chair. Add warm rugs throughout the space, and rearrange furniture so that it sits closer together to create a cozy, intimate feeling. If you have a fireplace, decorate the mantle with pinecones and evergreen boughs. Candles also help add light and warmth to a room. If you didn’t replace curtains and bedding during the fall, do so now. You can incorporate jewel tones that celebrate the season in your window treatments, throw pillows, and afghans. Or, you can recall the cool feeling of snow with whites, blues, and turquoise shades. If you enjoy decorating for specific holidays but want a more subtle look than is typically found in holiday décor, concentrate on color and small accents. Hearts are synonymous with Valentine’s Day, as are the colors red, white, and pink. A vase of red roses and a few accents, say a heart-shaped picture frame, pink and white throw pillows, or an afghan in shades of pink and red, are all you need to create a Valentine’s Day feeling in a space. Vibrant green and shamrocks are the mascots of St. Patrick’s Day. Add a bit of green throughout your home and, of course, a few shamrocks for good luck. Pastels, a cross, brightly colored eggs, and even candy make beautiful Easter decorations. A large, clear vase filled with colored eggs, or a pretty pastel basket filled with candy help make a room feel like Easter. When you think of Independence Day, you think of red, white, and blue. However, you don’t have to hang Old Glory in every space to give your home that Fourth of July feeling. Red pillows, a throw in shades of blue, a vase of red and white carnations – there are loads of ways to make it feel like the fireworks are set to go off at any second. Halloween is likely the easiest holiday to decorate for besides Christmas. But, if you’re looking for something more subtle than witches on broomsticks, you can get there with a few simple touches. Jack-o-lanterns and painted pumpkins make striking centerpieces. Throws and cushions in shades of orange, purple, black, and green, or a decorative dish filled with candy corn, instantly make a room feel ready for the night’s first trick-or-treaters. Thanksgiving is all about abundance, family, food, and, of course, giving thanks. The cornucopia, overflowing with harvest goodness, is synonymous with Thanksgiving and an ideal decorative touch for table or hearth. For Christmas, you can look beyond the tree and twinkling lights. Gift box bows make wonderful curtain ties. Pillows and throws in seasonal colors look beautiful on the sofa. Wrap wall hangings in Christmas paper so that they resemble gifts. Your options are limited only by your imagination. If you don’t want to go to the expense of fully redecorating your home every three months, you can decorate for the season with only a few strategic changes. The fastest way to change the look of a room (besides painting it) is to look at its accents. Window coverings, throw pillows, rugs, bedding, and towels are quickly and easily changed to match the season. They also don’t require an abundant amount of storage space for your seasonal changes, as you can usually use the same linens for spring and summer or fall and winter. When placing accents, look toward the mantel in your living room, your front door, the area above the cabinets in your kitchen, your dining room table, windowsills, and end tables. It takes only a few changes for your home’s décor to reflect the season.